The host of EJW Audio is Lawrence H. White, a co-editor of EJW and professor of economics at George Mason University. 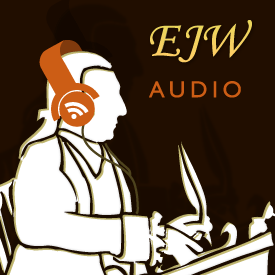 In a typical EJW Audio podcast, Professor White and the author of a recent EJW article discuss that article and related issues. Hugo Faria, a Venezuelan economist and expat now teaching at the University of Miami, tells the sad story of his home country, based on his EJW paper coauthored with Leonor Filardo. Shruti Rajagopalan narrates the history of liberal ideas and policy in India, from the 1920s to today, based on her coauthored article “Liberalism in India.” The conversation mentions B. R. Shenoy’s 1955 “Note of Dissent” (regarding the Planning Commission’s draft of the Second Five Year Plan), the brief text of which may be found on the website of the India Policy Institute (link, .pdf). Arthur Melzer is the author of the landmark book Philosophy Between the Lines: The Lost History of Esoteric Writing (University of Chicago Press, 2014). A chapter of the book, “A Beginner’s Guide to Esoteric Reading,” on techniques and devices used in esoteric writing, was republished in the May 2015 issue of EJW. The conversation, however, takes up Melzer’s entire book. The conversation is long and covers most of the important ideas of the book, and is divided into two parts. Bob Reed reports on the progress of replication at economics journals, based on the investigation conducted and coauthored with Maren Duvendack and Richard W. Palmer-Jones. Reed discusses the value of replication, its relation to meta-analysis, and related issues. Reed and Duvendack are the organizers of replicationnetwork.com. Jon Diesel discusses his article “Do Economists Reach a Conclusion on Organ Liberalization?” The interviewer, Lawrence H. White, adds insight as one who has had first-hand experience with waiting for a kidney. What should you know if you want to publish in EJW? Jason Briggeman and Daniel Klein discuss what EJW is, how it works, and what it is looking for. John Horowitz discusses his EJW article (co-authored with Cecil Bohanon and James McClure) showing that public finance textbooks very often fail to illuminate the welfare costs of taxation and to address those costs when taking up relevant matters such as the optimal provision of public goods and cost-benefit analysis. Morris Kleiner discusses his research as represented in Licensing Occupations: Ensuring Quality or Restricting Competition? (2006) and Stages of Occupational Regulation: Analysis of Case Studies (2013), both published by the W. E. Upjohn Institute for Employment Research. The latter book is the subject of a review essay by Uwe Reinhardt [“Does Occupational Licensing Deserve Our Approval? A Review of Work by Morris Kleiner”] that will appear in the September 2014 issue of EJW. In conjunction with the Acton Institute co-sponsored symposium “Does Economics Need an Infusion of Religious or Quasi-Religious Formulations?,” Robin Klay discusses her paper “Where Do Economists of Faith Hang Out?,” and Victor Claar discusses his contribution “Joyful Economics,” which interprets economics in terms of our good stewardship of God’s house.